Zo by Digizoid. It’s called a personal subwoofer and with all the mathematical algorithms they’ve put that includes a “patent-pending SmartVector sound contouring technology that dynamically contours acoustic energy to counterbalance signal loss due to the inefficiencies of a speaker and the human ear” and computational prowess that’s as mind boggling as an Intel quad core processor, it promises to shake the ground of your feet with, well, bass. And not just bass but huge, fat, pounding bass at that. And at $120.00 in Amazon, is it any good? Most of it is really marketing and PR talk to be honest and to use less slightly complicated terminologies, it is very much a portable amp. What’s special about Digizoid though, is that this would be the first serious product I have seen to introduce portable amps to the mass consumer market and not just audiophiles. Digizoid is perhaps hoping for the Zo to do what Beats by Dre did for headphones – that is to make products that could be used by audiophiles but to be largely bought and used by the mass market. Will they gain equal success or not is yet to be seen but they are surely off to a good start. The Zo is basically a rather small device. It’s even a bit shorter compared to the old ipod Nano. It feels very light and almost cheapish in a certain manner. The high gloss finish hopes to add more class to the product as with the sleek multi-colored LED that serves as a visual volume indicator. It’s as simple as powering it up, plugging your source and headphone then increasing or decreasing the volume of the bass in your song. 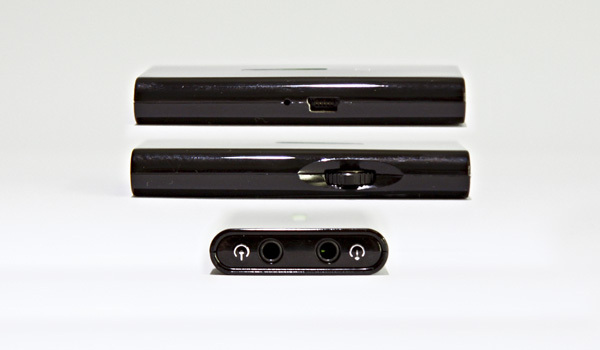 On the other side is a mini usb port that will serve as your means of charging the internal batteries. You can use the Zo while charging but there will be a lot of noise added to your music due to the electrical noise entering the signal circuitry so that is not recommended. For the sound itself, I failed to test it against the similarly priced FiiO E7 and so I decided to compare it with something that’s priced twice its value but is currently my favorite bass amp – the C&C XO2. If you are not familiar with this amp, wait for an upcoming review. As for this article, my aim really was just to compare the Zo to what bass amps can really do when done properly. In short, I will simply describe where it does good and where it can definitely use improvements. First and the most problematic of all is that the lineout of your DAP cannot be used to send line-in signal to the Zo. The volume will be unbearably loud and you should never do this because it might just end up damaging your IEM or headphones. This means, you have to connect your player to the Zo using your headphone out. To the average consumer, this is nothing but for audiophile who know better, this is definitely a huge concern. Second, the switch for the volume controls are rather numb. You really have to push up or down to get the volume moving. The multi-colored LED does not help as much because sometimes, the color change when adjusting volume is so subtle you are barely noticing any change except for what you hear. Other than that, let’s move to how it sounds. As far as bass is concerned, it definitely adds a lot. You can control this and with my setup of an HM602, volume level 2/10, the Zo only needs two clicks as well to bring enough bass and energy to my Superlux 381f before I felt it to be overpowering and with at least 8 more clicks until max level, there is definitely much more bass in this personal sub. The not so nice part about the bass is this. It is not just bass that is bumped up but the mids as well. It is inevitable honestly but the mids are bumped up way too early that the track gets muffled and dark quickly. If you prefer dark sounding signatures then this might be good for you but if you are very keen on details and texture and air, the Zo will quickly dissipate those as you add more bass into the music. Also, the bass is not beautifully added bass. When you start using high end cans with the Zo like the Edition 8, it will reveal all that is wrong about the Zo. The bass is badly textured and has a rattle at the very edge that is clearly heard. This will not be a problem with lower ends cans or mid-fi cans which the Zo is really targeted at though so you are definitely limited with what cans you can and cannot use with the Zo. Lastly, because of the fact that the signal must always come from a headphone out, the internal amps of your source will have already affected the sound signature before it even passes through the Zo hence changing from one source to the other will create significant changes to what you hear. So for synergy, I would say the Zo is good for what it is intended to do. If you own an iPod and use the Apple earbuds, the Zo will definitely make you smile. As long as you steer clear of high resolution players and top tier cans, the Zo can definitely add much more to your music especially for Rap, R&B, House, etc. But if you had the extra cash and prefer something much more civilized, wait for my review on the C&C XO2. For thrice the price, it will offer you added bass that is simply sublime and just to tease you, its power output on single ended is equal to the power output of the iBasso Toucan as balanced mode. BBE is a sort amps per se ‘ but tailored by the manufacture to meet a certain sound signature ? one with the right sense of music would be able to accomplish the same ‘ by playing around with a headphones amps controls and settings ? ? was trying to get a better sense about the zo2 and in a while will have zo3 ,is it a sort of http://www.bbesound.com/products/sonic-maximizers/ ? or / and http://www.fxsound.com/support/contact/ for windows ? I would actually say neither to be honest – it really does target the lower frequency and does it well based on my own 2.3. There is some slight bleed but the level of control is excellent and the form factor good. I enjoy it because it doesn’t mess with the overall tonality just the bass. BBM and FXSound can change a lot more. how would you compare to BBE complete package , to FXsound ? would you prefer one over the other ? If I use enhancements it is only sparingly and my preference for portable audio is BBE. I believe the team at Zo have a v2 out also? Have you tried the ZO2 or only the ZO? For this review only the ZO as the Z02 was not released then. This is a poor review. You seem to know little about the product. Plus it is full of audiophile nonsense. Hi Matt, we welcome all comments. Can you enlighten us on where the review can be improved? Thanks again Matt for the comments – though ‘being hard to use’ is an opinion more than any factual dispute – to say that it is easy or hard is really up to the personal use and in this case the reviewer found it hard. You own the Zo Matt? I would love you to submit a review of it to us and I will gladly post it for you complete with credits. I’ve always thought of the headphone out as having a stronger signal (more wattage or amperage?) than a line out. I wonder why this device would be overloaded by a line out? Well considering the comments so far I think the Zo guys are backing themselves into a corner here – if it requires one of the engineers to come on and properly explain the intricate setup and use of this unit to get the best out of it then sadly many people will miss this simply because the price point and name to me targets the consumer market. The pick up and play guys simply are not going to go ‘follow a strict procedure’ for setup when on the subway holding an ipod and a set of mobile cans. You can write any depth of detail in a manual but the more you explain it the further away the point gets. Trying to be technical but at the same time calling something SmartVektor is complete nonsense – sorry Zo guys but call it for what it is or else call it the iZo. The ZO is really easy to use. You set the volume with your music player and use the ZO to boost the bass. There are 32 levels on the thing but not each step changes the color of the LED light so you need to listen to set the bass where you like. Yes the ZO boosts the volume slightly but “turning it up” does not increase the volume just the bass level. Smart vector is just marketing mumbo-jumbo like “S-logic”. All you need to know is it is an analog bass/frequency booster. It is the best bass boost I have heard. I personally own the Go Vibe Magnum and Vulcan+ which have a bass adjuster dial and the neat thing about this is that unlike some lesser devices they actually do a great job of isolating the bass signal and amping it without muddying the mids – it does genuinely amp the bass. Now in the Zo Matt is it the same effect or do you think it bleeds into the mids? The ZO does boost the mid, it keeps them more in line with the bass. The bass is very good with very little mid range bleed. Curious Matt, what is your setup that you are using with the Zo? Mostly Clip+ Rockboxed as a source. I tried it with a bunch of phones: Ortofon e-Q5, Jh13 Pro, Panasonic Hje900, Earsonic Sm3, Senn Px100, Aiaiai Tracks, Grado SR60, and Denon d2000. You can really adjust the bass to the phone and source material. The Denons might be nice on the first step and the Ortofons could take the ZO at full blast. The others would fall somewhere in between. There is a slight hiss with the e-Q5s and the JH13 pro, none with the other phones. I notice the vast majority of your headphones are low impedance or easy to drive (kudos for the Tracks, one of my fav’s from the last year). Have you tried it with higher impedance, ortho or desktop setups? No that is the end of my headphone inventory at the moment. By the looks of your selection I would hazard a guess and say you like rock and/or electronica given the already heavy bass bias in some of those cans. It would be fun to try this on a bass light headphone such as the K701 or some of the higher end W series ATH just to see what would happen. Ortos are bass light and can become quite bass heavy with the ZO, no clipping or other nastyness. I would be fun to try them with bass light full size phones. 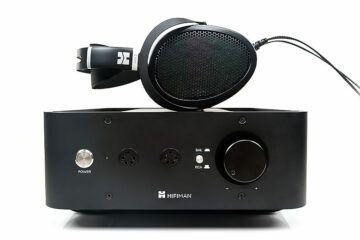 The HE6 and even more so on the LCD-2 (2 orthos) are very comprehensive on their bass response but in the particular case of the hifiman range they need good amplification or the sound clips and thins out meaning the Zo will likely come up short regardless of its ability. 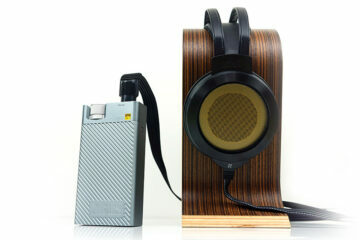 The perfect candidate in my mind for this is the AKG K701/2 and the ATH W5000. Wow, the list of comments are rather long on this review…. might as well chime in! Hahahaha!!! I totally agree with you on the S-logic of ultrasone! Haha!! Well, whatever marketing name they gave it, I think it works because the sound of the Edition 8 is really just beautifully organic even compared to the very best closed cans. As for the bass boost of the Zo, like I said, in its price category I guess its the best because there hasn’t been anything that can be compared to it but definitely the XO2 will kill it anytime of they day. Don’t get me wrong, I was really hoping this Zo would perform well hence I bought it right? It’s not exactly a freebie sent this way but again, personally disapppointed on how it performed. As for the condescending tone of the article, I thought it was still very neutral. Just really saying what I felt was the real story behind it. I still agree that its better to stick to lower tiered headphones rather than high end ones simple because the high resolution cans reveals all the flaws of the Zo. As for the headphones you tested it on “Senn Px100, Aiaiai Tracks, Grado SR60, and Denon d2000”, I think the Zo would pair well with these but I don’t know about the D2000 and Tracks if it would sound good since there would probably be too much bass and no more clarity and highs… anyway, I’m saying stick to cans like these and you’ll be fine. Just don’t go pairing the Zo up with an Edition 8 for one. As for the verdict on what people in the Headphiles community had to say, not a product they rushed to buy from me when they heard it, unlike the XO2 which everyone was willing to pay for 3x the price. I think that says it all. I do hope version 2 of this would be able to address those issues. 1.0 The ZO’s signal conditioning technology is entirely analog, not digital. So, there are no algorithms or computations taking place. 2.0 The ZO is not just a subwoofer device. Integrated amplifier circuits deliver 4 to 5 db of threshold gain, and up to 20 db of dynamic gain. Therefore, a secondary headphone amplifier is not required to drive high impedance headphones. 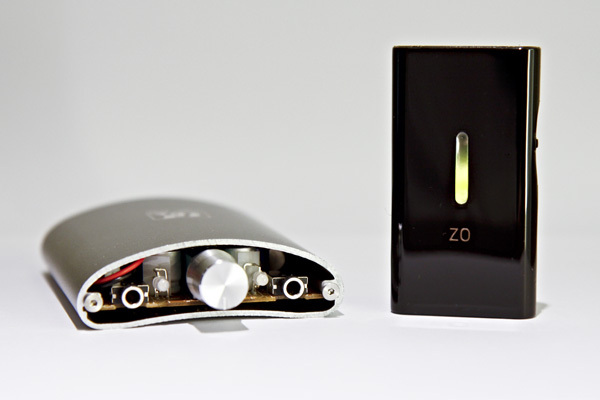 Use of an additional headphone amplifier in-line with the ZO will produce unpredictable results, it also exposes both the ZO and headphone amp to potential electrical overstress from each other, and is therefore not recommended. 3.0 The ZO was not designed to be coupled directly to a line output. Doing so will result in unpredictable results, and depending upon the line-out voltage level could overstress ZO’s input circuitry. The ZO instructions specify connecting it to a headphone output only. However, an in-line volume control may be used between the line-out and ZO’s input to accomplish this task safely. 4.0 The ZO is not “as simple as powering it up and plugging in your source and headphones”, at least not upon first use. There is a specific procedure for setting up the sound source and ZO to assure proper operation. When setup properly, ZO will not induce distortion, clipping, or noise. So, if you are experiencing any of the aforementioned, its likely the setup, not the ZO. Failure to follow that procedure may result in unpredictable performance. The instruction manual provides detailed explanation of the procedure. 5.0 The ZO’s adjustment control is not for volume, rather it is a controller for selecting response profiles (i.e. SmartVektor contours). Regarding the SmartVektor controller switch, it will select a different frequency with each rotation of the switch, and continuing to hold the switch in the up or down rotation position for longer than 1 sec will engage Autoscan. The Autoscan function steps 4 frequencies per second. The ZO instructions explain this. 6.0 The ZO doesn’t increase or decrease the volume of bass, instead it allows the user to select from 32 different ‘frequencies of emphasis’ in the range from 60Hz down to 20Hz. Along with each of these frequencies, a corresponding sound contour profile is engaged which balances the energy of mid-band frequencies and maintains their presence within the track. The mid-band contour frequencies extend upwards as high as 3000Hz. Therefore, if the audio track contains frequencies encompassed by the frequency of emphasis and it’s associated contour frequencies, they will be emphasized accordingly. Otherwise, no emphasis will occur (i.e. the ZO does not add bass, it only responds to the frequencies contained in the track). The end result is vitalized and balanced sound. 7.0 The “Mult-Colored LED” is called a LightScale. It provides a visual representation of the selected frequency of emphasis. speakers, and other powered audio systems in addition to earphones/headphones. 8.2.1 RED contour levels deliver extreme low frequency response. These settings work well for watching movies or playing video games. 8.2.2 AMBER contour levels provide subwoofer intensity bass response. These settings work well for bass intensive music tracks. 8.2.3 ORANGE contour levels can be considered ‘extended bass boost’. 8.2.4 GREEN contour levels fall into the region of typical bass boost down to flat frequency response (i.e. headphone amp). Outstanding reply and many greeting to you and the team at DigiZoid. Welcome to headfonics as well guys! I hope to see digizoid create more products. As for the reason I contacted you guys, its now been fixed and worked out. Thanks for the help guys! Oh I would like to place this in between my ef5 and HE6 just for fun!